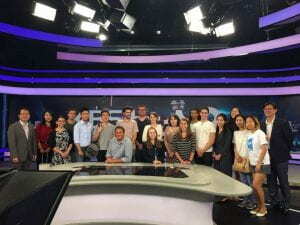 GWIKS’s first two-week summer study abroad program in Seoul, South Korea ended on the 17th of June. 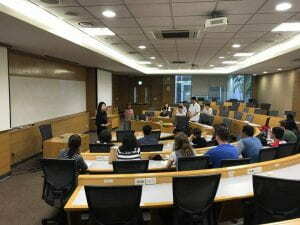 The program was established to educate the students about the two Koreas with their identities, shared history, division, and economic differences. Under the instruction of Professor Jisoo Kim and Miok Pak, there were nine undergraduate and six graduate students that participated in this summer program. 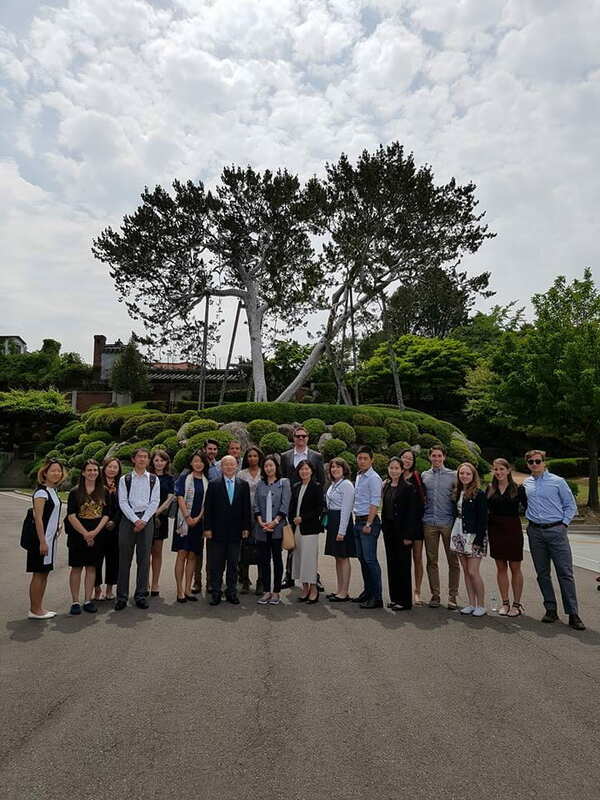 These participants were selected through a competitive application process as the program was designed to provide an opportunity for students who are pursuing Korean studies to visit Seoul and learn firsthand about the two Koreas. 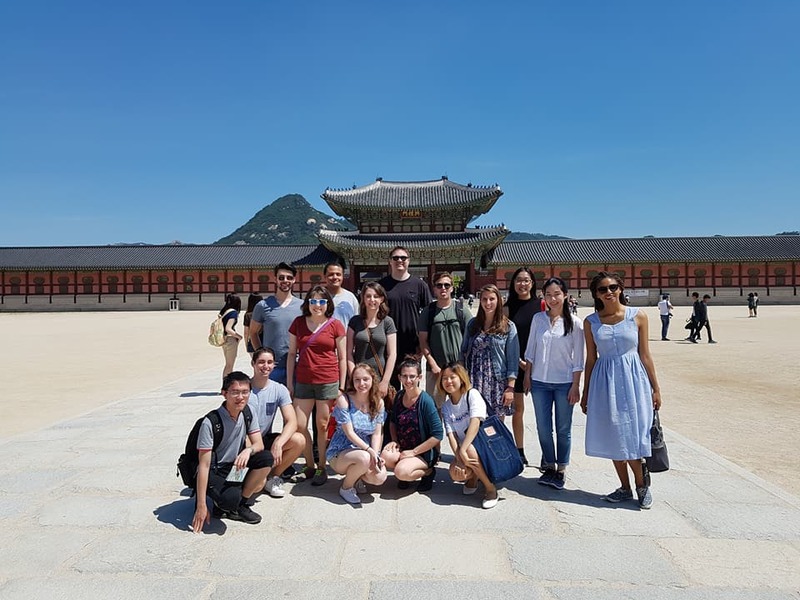 This summer program was scheduled with site-visits that allowed the students to experience firsthand the history, culture, politics, economy, and society of the Koreans. 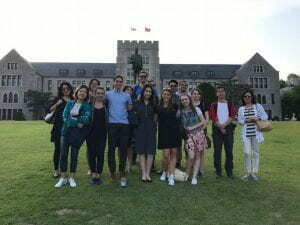 On the first day, students explored the past of Korea by visiting Gyeongbok Palace and Bukchon Hanok Village. The Gyeongbok Palace was the main royal palace of the Joseon dynasty in the Korean Peninsula and was built in 1395. Bukchon Hanok village is a traditional village that is composed of remaining Joeseon houses that were preserved to show the 600-year-old urban environment. 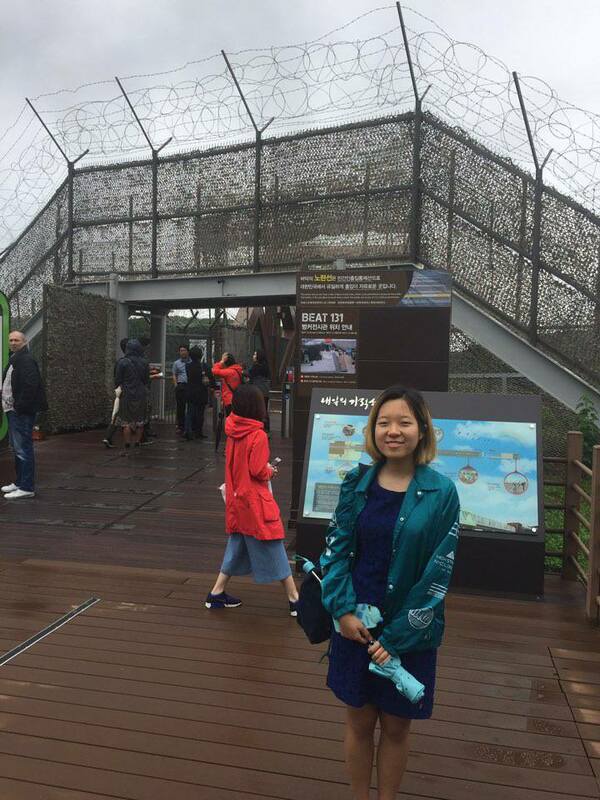 The second day, the students learned about the Korean War by visiting the War Memorial of Korea in Yongsan and the National Museum of Contemporary History. The next day, DMZ (Demilitarized Zone) and JSA (Joint Security Area) were visited to learn further about the Korean war and the history of the divided country. JSA is the only part of the DMZ where both Korean forces face each other. It is used for diplomatic engagements between the two Koreas and is the only neutral area where free movement of both sides are allowed within its boundaries. To learn more about the inter-Korean relations, the students visited the Inter-Korean Transit Office in Dorasan and the Seodaemun Prison on the fourth day. The Dorasan Station is a railway station on the Gyeongui Line, which is the northernmost stop on South Korea’s railway line. Seodaemun Prison was where Japanese soldiers tortured and later executed Korean Independence Movement followers and currently is serving as a memorial to salute the Korean patriots. 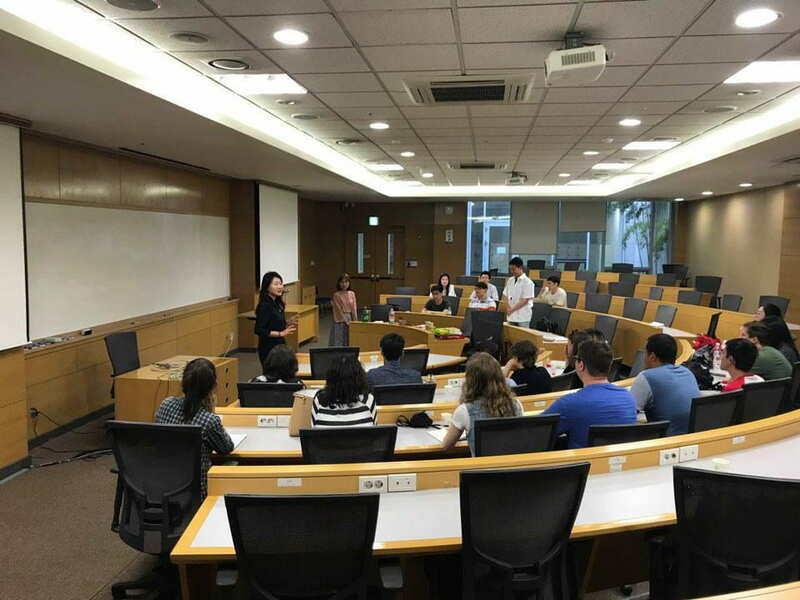 These visits later extended to a discussion about North Korean Human Rights Issues at Korea University as the university specially held a seminar for our students. The fifth day continued the talk about North Korean Human Rights as the students visited the UN Human Rights Office located in Seoul. 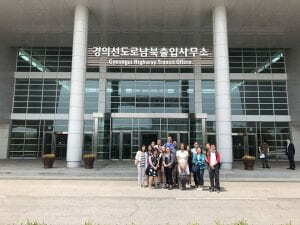 At the UN Human Rights Office, they met with Human Rights Officer Yunkyo Ahn and learned why the Office is located in Seoul instead of Pyongyang. After listening to Officer Ahn’s presentation, students had a Q&A session that allowed them to learn more in depth about human rights issue in North Korea. After the visit to the UN office, the students went to the Blue House Sarangchae for the hour English guide. 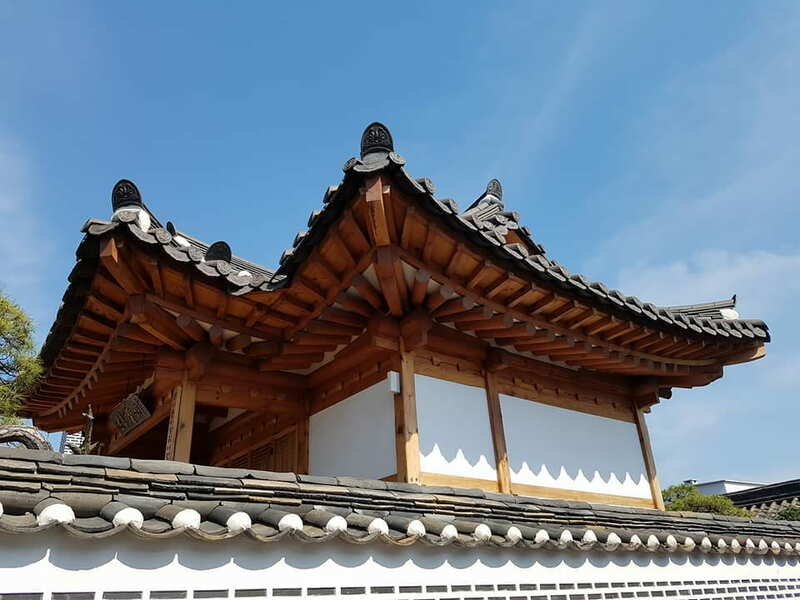 Blue House is where the South Korean President resides and Sarangchae is an area that has exhibitions about Korean culture and the history of former presidents. The weekends were opened for student’s independent traveling. The students submitted their travel plans for approvals from the instructors. 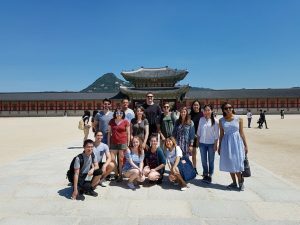 Some students managed to leave the Capital City and others visited recommended tourist places in Seoul that were not included within the two-week schedule. The program had a busy schedule the following week as well. It was composed of learning about the modern days of South Korea. 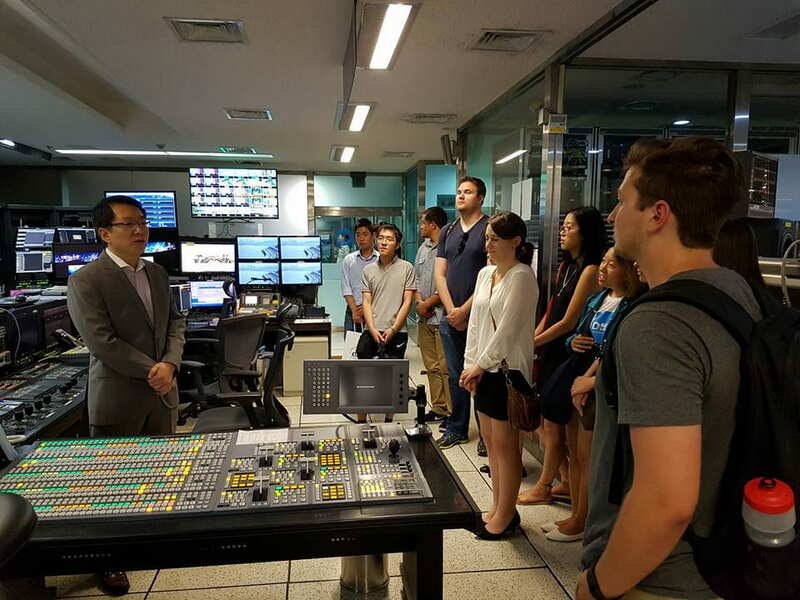 On Monday, the students learned about business and economic growth in South Korea by visiting one of the biggest corporation groups in South Korea – LG. 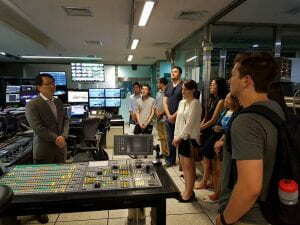 Later Samsung and SK-Telecom were also visited on Wednesday to follow up more about the economic growth in South Korea. 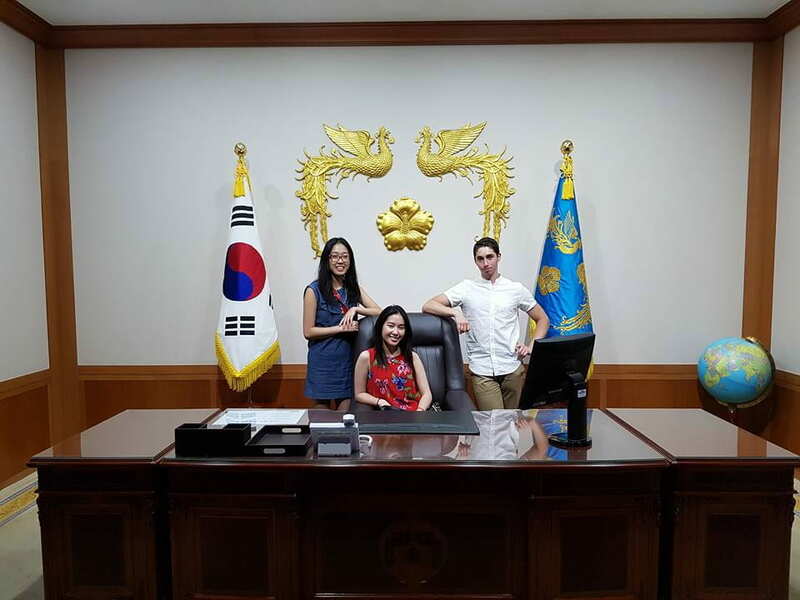 The same Monday after the LG visit, the students visited the Constitutional Court of Justice to learn about the law in South Korea. 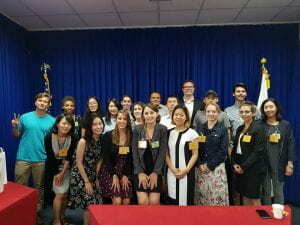 They had the honor to meet with Judge Chang-ho Ahn to hear about the Constitutional law in South Korea firsthand. 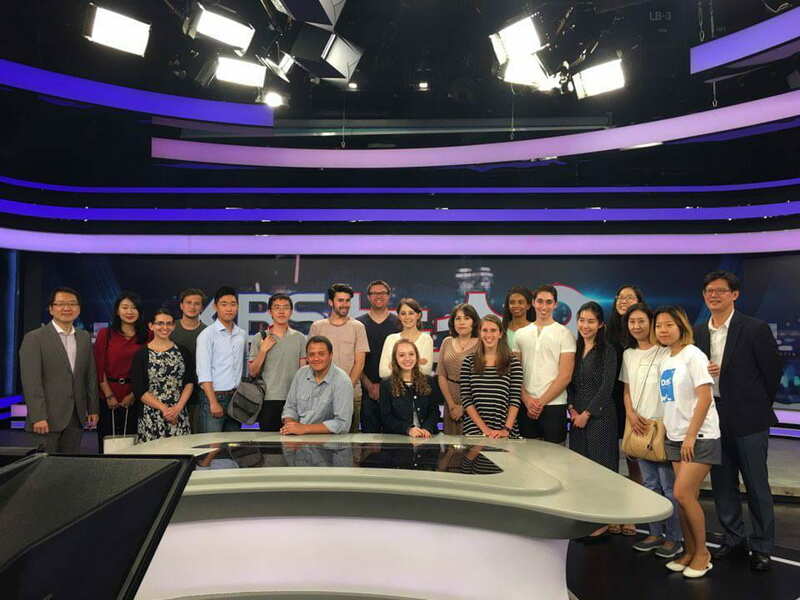 To learn about the role of media in South Korea, the students visited the Korean Broadcasting System (KBS) Headquarter and attended a lecture about Korean wave. They also had the opportunity to attend a rehearsal of a Korean music program – Yu Heeyeol’s Sketchbook. On Thursday, the students continued to explore the modern days and issues in South Korea, as they went to Hana Foundation to learn about the resettlement of North Korean refugees. 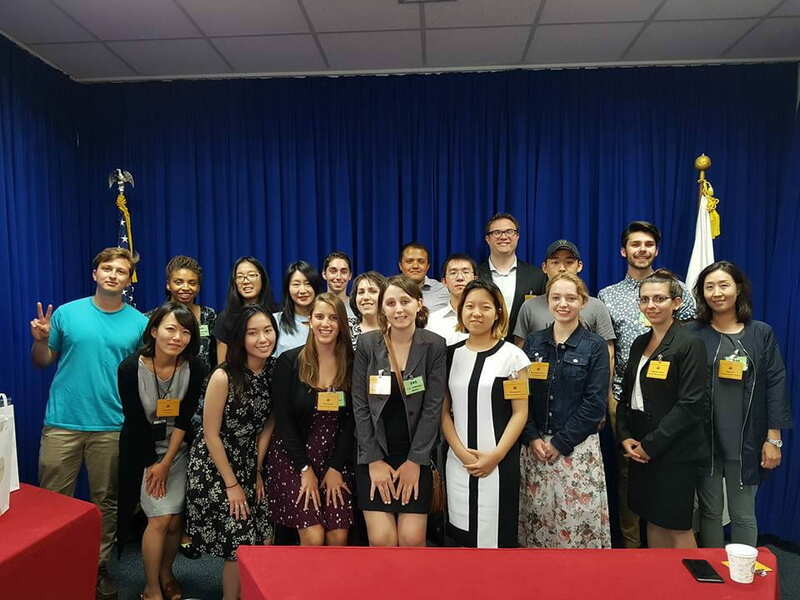 Later they visited the Public Affairs office of the U.S. Embassy to hear a briefing about the work of public diplomacy in South Korea. 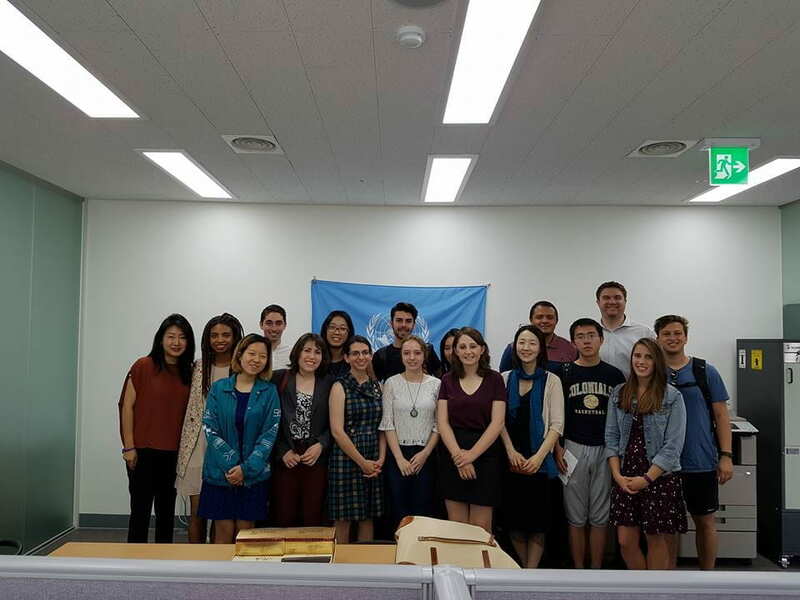 This marked the end of the well-rounded summer study abroad program regarding the two Koreas. The students actively attended seminars, briefings, discussions, lectures that were held at the sites they visited within the two weeks. Most of the evenings were re-capped with a wrap-up seminar back at the hotel. This two-week program ended with student’s portfolio presentations. (shared here) Students decided on their research topics and presented their research proposals, which will be completed back at the university. Please keep an eye out on their final research debrief during the Fall Semester!